Aluminum cans for soda and beer are made from about 40 percent recycled materials. Although most people don't mind recycling, the extra room it takes to sort and keep recyclables can make the task lest appealing to some. 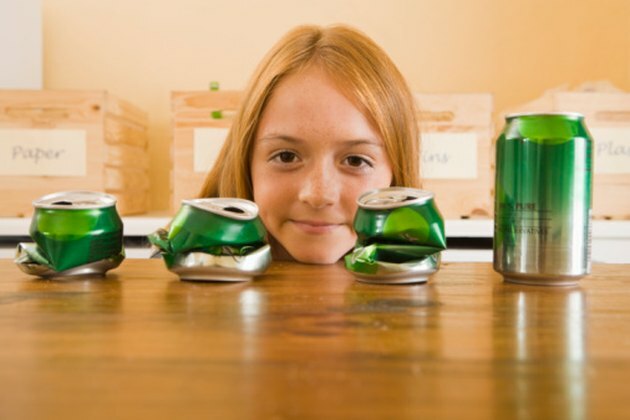 Empty soda cans are especially bulky, when compared to cardboard or paper that can be easily flattened and stacked. Instead of tossing those pesky cans into the trash, create a contraption to help you easily crush the cans for recycling. Crush soda cans to make more space in your recycling receptacle. Lay the pieces of wood end to end with a 4-inch side on the work surface. Lay the hinge on top of the pieces of wood so the bend of the hinge is at the seam between the pieces of wood. Screw each each side of the hinge into one piece of wood. Fold one board over on top of the other, and check that they align correctly. If you attached the hinge correctly, the two boards should line up exactly on top of each other. Unfold the boards, and attach a jar lid about 2 inches from the outer edge of each board . Place the can crusher on a sturdy, flat surface. Open the boards up and place an empty can in the center of the bottom lid. Place the board on top, and push down with the handle.